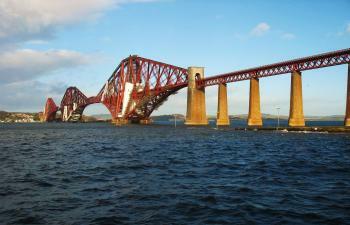 The Forth Bridge is a late 19th century steel cantilever railway bridge. It connects Edinburgh with Fife over the estuary 'Firth of Forth' in the east of Scotland. This single, monumental structure is considered a creative masterpiece and a feat of civil engineering. The bridge is 1.6 miles (2.5 km) in length, and the double track is elevated 151 ft (46 m) above the water level at high tide. It is supported by three great four-tower cantilever structures. To prevent the steel from rusting, the structure is covered with red protective coating. It still is in active use as a mainline railway bridge. Before the year 2015 ends, I needed to go on ‘mileage run’ to secure KLM Elite Status for next year. So I went on the lookout for a cheap return ticket to a nearby destination, including opportunities for an unvisited WHS of course. The choice fell upon Edinburgh – although I had visited the city before in 2001, I had at the time not been to the Forth Bridge. 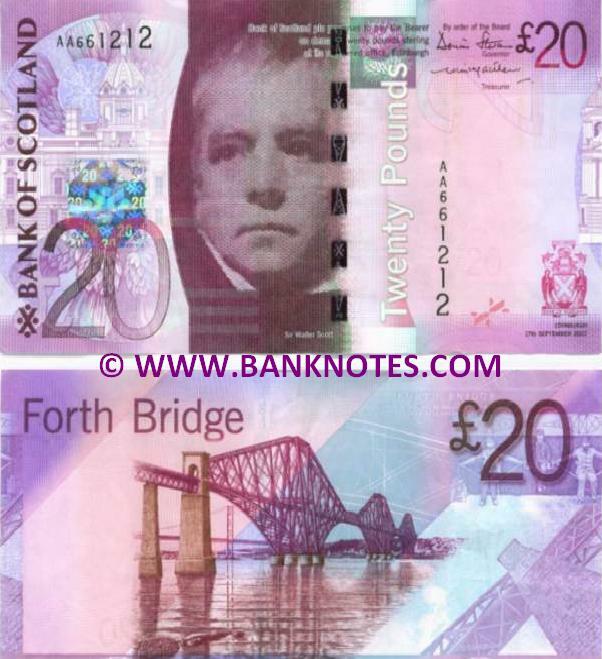 This 2015 addition to the List has many superlatives attached to it in its nomination file, such as “icon of Scotland”, “potent symbol of the Railway Age” and “unique milestone in the evolution of bridge and other steel Construction”. 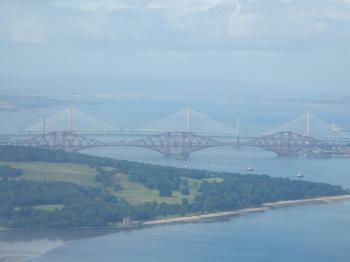 The Bridge lies just a few km from Edinburgh Airport, and already good views of it can be had from the air. I had especially chosen a window seat, and though it was a bit hazy early morning the three big arches were clearly recognizable on the approach. 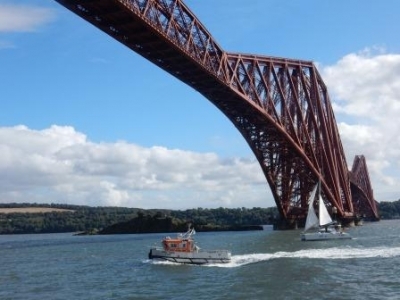 December is not a particularly good month to plan a visit to the Forth Bridge: the Firth of Forth ‘cruises’, where you can admire the construction from the water, aren’t running past November. And since a few days an extra handicap was added: the Road Bridge next to it had to be closed off til the end of the year to all traffic. Normally you can walk on it or cruise by on a double-decker bus. So that left me with only one option: take the train across the bridge. This wouldn’t mean the best views, but it is the ‘real thing’ as only the bridge itself is included. From Edinburgh Waverley Station frequent regional trains ply this route. I opted for a return to North Queensferry, the town just at the northern end of the bridge. Waverley Station itself is a maze, not exactly self-explaining for a first-time visitor. At first I got through the gates to the wrong platform, and had to be ‘freed’ by staff as my ticket wouldn’t let me out again. When I finally ended up at the right platform and on the right train, it could not leave because it was blocked by another train. So all passengers had to move to a different one. The ride itself was quite short, some 30 minutes. The bridge isn’t visible very well while you’re on it, you just see some red steel bars flashing by. I got off at the small station of North Queensferry. From here I descended down the road to the shore, to get unobstructed views of the Forth Bridge. You can walk almost underneath it, before you’ll end up on a Private Road. Trains pass by fairly frequently with a lot of noise, I guess the many houses in the vicinity of the construction need good soundproofing. The bidteam of the State Party managed to write 162 pages about the Forth Bridge: its history, its construction, its paint and how it compares to all other bridges in the world are all covered. I liked the explanation of the way how a cantilever bridge works via the Human Cantilever photo. It even includes a ‘viewpoint study’ comprising 78 views on the Bridge from all surrounding areas (including the Edinburgh Castle, see the 'Viewable from another WHS'- connection). The glowing nomination dossier calls it “an aesthetic triumph in its avoidance of decoration” and a “modern design in which form follows function”. But in the end it is what it is: an iconic bridge painted in a distinctive red colour. Is it the most impressive (railway) bridge that I have ever seen? I am thinking of the Sydney Harbour Bridge, or of railway bridges spanning deep canyons (such as the Goteik Viaduct that I recently crossed in Myanmar). Or among WHS, the Vizcaya Bridge. The Forth Bridge surely is in the same league as those, but I would not rank it above them. The spume sprayed high up over the bow of the Maid of the Forth as she cut through the giddy swells of an incoming tide. Ahead, the choppy grey water and the blue cloud-flecked sky were delineated by a false horizon: the spans of the great Forth Bridge. There was a high Victorian arrogance to the way it marched across the firth, undaunted by the waters swirling around its piers. Yet as our boat slid into its shadow there was also beauty revealed in its criss-crossing web of steel girders, the matt red-brown of Morocco leather. I expected the clatter and flare of a surging steam train overhead, sparks flying, Richard Hannay in The 39 Steps leaping for his life. Instead the regular blunt-nosed two-carriage Scotrail commuter trains grumbled above me seemed out of place, unlovely caterpillars on the spreading boughs of a mighty Scottish oak. I think Frederik Dawson’s comments below noting the journey from the 1781 Iron Bridge in Shropshire to the 1805 Pontycyllte Aqueduct in Wales to the 1890 Forth Bridge is very insightful. As I was born-and-bred in Manchester I have tended to see the so-called ‘Industrial Revolution’ as a story of manufacturing – ingenious solutions to make more stuff, quicker. But it was also a story of communication – ingenious solutions to get more stuff from one place to another, quicker. While the mills may still exist – vide Cromford or New Lanark on the UK’s List – the manufacturing solutions, the looms and engines and pumps are moveable and have been scrapped, replaced or relocated to museums and hence are not particularly visible on the List. However, the communication solutions left more of a mark on the map. You can still walk across the Iron Bridge (and it was still used for motor traffic well into the 20th-century). Boats still soar through the sky at Pontycysyllte, albeit for pleasure rather than trade these days. And the Forth Bridge is still a vital lynchpin tying Edinburgh to the Kingdom of Fife across the firth (it seems crazy that until as recently as 1890 anyone wanting to travel north from Scotland’s capital would have either had to divert far to the west or take a ferry). The bridges have left their mark on the country in a way that other communication solutions maybe haven’t (see the UK’s abortive attempts to seek inscription for the S.S. Great Britain and Great Western Railway). One can therefore understand the desire of the UK – the nation that in its own eyes ‘gifted’ the Industrial Revolution to the world - to get these landmarks of engineering inscribed. There are several ways to see the Forth Bridge. It still serves its original purpose as a rail bridge. Trains linking Edinburgh with the north-east of Scotland still use it, though a simple journey from Dalmeny to North Queensferry (three minutes each way, an off-peak return costing a princely £3.30) would be the most economical way to ‘experience’ it. It would only be the only way, I believe, to visit the site itself as only the bridge itself is inscribed. The space beneath its spans is outside the site boundaries. The bridge can be seen from land. We drove beneath the bridge to reach the free carpark located along the waterfront at Hawes Pier (follow brown signs for ‘Inchcolm Island Ferries’). The brickwork towers of the rail approaches soared above our heads. 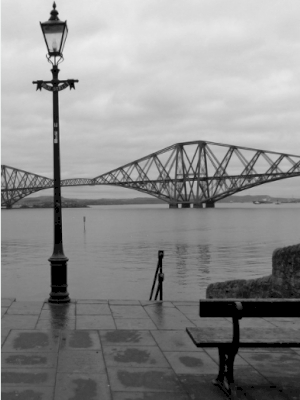 Walking distance down the road is the pleasant historic jumble of South Queensferry and several eateries orient themselves towards the firth – I can confirm from an earlier visit that the night-time views of the spot-lit bridge from the terrace of the Orocco Pier restaurant are stunning. The bridge can be seen from one of its companions. Three bridges now cross the Firth of Forth at this spot – the 1890 rail bridge, the 1864 Forth Road Bridge and the 2017 Queensferry Crossing. The Road Bridge is now only open for buses, taxis, cyclists and pedestrians – all other vehicle traffic is routed via the M90 over the Queensferry Crossing. Or, the bridge can be seen from below, from the water. That was what I decided to do. Two competing companies offer boat trips from Hawes Pier – Forth Tours and Maid of the Forth. I booked for the 12:15 Maid of the Forth tour to Inchcolm Island, a route that takes you downstream beneath the Forth Bridge to spot cormorants and grey seals on the rocky islets that dot the waterway before tying up at Inchcolm Island, home to a well-preserved Augustinian abbey whose central octagonal chapter house looks like something from a Georgian monastery. There is an additional fee for those who wish to disembark and explore the remains of the 12th-century abbey (and the 20th century artillery posts located here to protect Edinburgh, the bridge and the naval yard at Rosyth further upstream). Alternatively, remain on board and the boat will take you back beneath the bridge, sweeping around to show you its more modern companions before it docks back at Hawes. In total the cost for the Maid of the Forth was £14 per adult, with an additional £6 charge for alighting at Inchcolm for 90 minutes, something I highly recommend. One odd thing about the Forth Bridge is that now it has UNESCO status no one seems to know precisely what to do with that status. There is a 'contact and education centre' for all three bridges in South Queensferry but whose website seems geared more towards school trips. The bridge itself, as critical railway infrastructure, is owned by Network Rail. They are apparently exploring how to commercialise the bridge better, with one option being creating a footpath up to allow guided walks on the bridge. But, for now, I whole-heartedly recommend taking to the waters of the Forth, as any travellers heading north from Edinburgh would have had to do until the bridge’s inauguration. On the way back south I noticed that I was in the last carriage and there was a window facing backwards, as such I was treated to this rather wonderful view, which is probably the best you can get. One of the most outstanding of UK’s long list of World Heritage Site is that the list contained at least 3 bridges that represent the rapid development of technology on bridge construction after the Industrial Revolution, Ironbridge, Pontcysyllte and the Forth Bridge. To be honest when I visited those bridges in England and Wales, I felt a bit underwhelmed and disappointed, but when I saw the Forth Bridge and looked back to Ironbridge, I felt awed and admired how mankind can achieve. On late afternoon, I drove to Queensferry on the way back from Falkirk, the gigantic bridge could be seen faraway. And when I was in the old city quarter, the bridge was like a giant protecting the whole city. The whole city was really quiet, only few people I saw, I parked my car and took many photos of the bridge. One local woman walked pass me while I set up my tripod and said to me with proud “Such a great sight, isn’t it?” and I wholeheartedly agreed with her. Even though I spent my time in Queensferry to get the best shot of this iconic bridge for less than 30 minutes, I felt that the Forth Bridge is a worthwhile place to visit as one of Scottish landmarks and mankind engineering great milestones achievement and definitely a really good World Heritage Site. I had crossed the Forth River by train on this bridge twice before but had not noticed the human creative genius, so I had to go back to check it out. On a Tuesday I took a train from Edinburgh Waverley to Dalmeny and approached the Forth Bridge WHS on foot. On High Street in South Queensferry, there was a cozy riverside Italian restaurant with tables by huge clear-glass windows, from which you could enjoy the unobstructed view of the bridge. Also on High Street was a little museum called Queensferry Museum with exhibition on the bridge, but it was oddly closed on Tuesday (and Wednesday) when I was there. There is not much to add to the reviews about the Forth Bridge - it's one of Scotland's most recognizable landmarks, and if you are lucky on your approach to Edinburgh Airport, you can already see it from the air. Many years ago, I took a bus from Edinburgh into the highlands that used the road bridge next to the rail bridge, but I didn't want to count this drive-by as a visited site, so I took the train to North Queensferry (that actually goes across the bridge) and walked down to its northern end to take some more photos. Then I took the next train back (they are very regular) to Dalmeny to view the southern part. On the northern end, you can get basically directly under the bridge and take nice close-up pics, while from the southern end, you have nicer panoramic views. This is an interesting, but not really world-class site that makes an easy excursion from Edinburgh and could also be combined with a boat ride under the bridge. Robert Louis Stevenson's novel "Kidnapped" ends with a daring ferry crossing across the Firth of Forth, allowing the hero, David Balfour, to confront his duplicitous uncle; if the events of the book had taken place 150 years later, David might have had an easier journey via the Forth Bridge. The cantilevered Forth Bridge is indeed an engineering marvel, and when it opened in 1890, provided the first alternative to a ferry crossing. The railway bridge was one of the first major structures in the United Kingdom to be built of steel, and its red-painted spans are well-recognized. I first saw the Forth Bridge during a tour of Scotland in 2009; after it was inscribed as a World Heritage Site in 2015, I made sure to visit again that fall. I drove to downtown South Queensferry, outside Edinburgh, and parked near the water's edge not far from the base of the bridge. This vantage point provided a great view of the bridge, as well as rail traffic transiting the bridge. I'm excited to hear there are plans for a visitor center in North Queensferry with a bridge walk to South Queensferry, and may have to return one day when the project is completed. 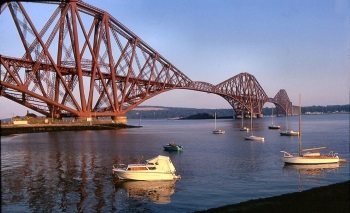 Logistics: The Forth Bridge can be transited by rail by taking the train from Edinburgh to North Queensferry. 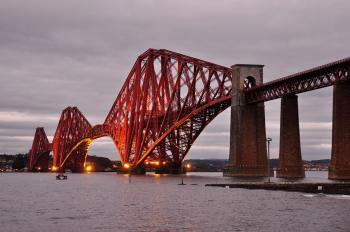 To see the bridge up close, you can also park in either North or South Queensferry. 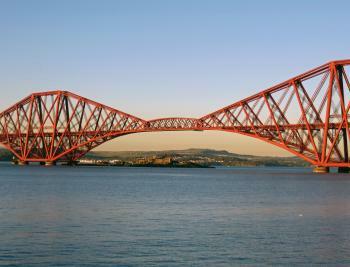 I visited the Forth Bridge in 2007. The picturesque monument is stunning. My experience at the bridge was based on an afternoon visit to Queensferry, and travelling across the Firth of Forth itself several times. In addition, there is a pleasant view from Blackness Castle that really showcases the massive scale of the Forth Bridge. During these excursions, I was able to appreciate multiple views of the Forth Bridge, which enriched my appreciation of this iconic Scottish landmark. I've read there are plans being implemented for a visitor center and platform. I do wish this was available in 2007, but I can't complain. I enjoyed my quite and serene stroll within the waterfront area of Queensferry, with the Forth Bridge towering above me. Perhaps the 2nd best way to visit the Forth Bridge is actually riding the train, since this engineering marvel is still very much in service, though pictures may be difficult! 189 Community Members have visited.